The rivalry between the C&O Canal and the B&O Railroad came to a head in the mid 1800s when continuation of both the Canal and the railroad tracks required passage through the narrow Point of Rocks section of the Potomac River basin. This is where the river cuts through the Catoctin Range of the Appalachian Mountains for 13 miles west to Harpers Ferry. Essentially, the B&O bought up much of the land in this stretch, but the C&O countered with its claim that it had the rights to the route based on a previous charter it inherited from the Potomac Company. Although the Canal company won the battle after a four-year court fight, the Maryland General Assembly ruled that the C&O Canal must share the right of way with the railroad as far as Harpers Ferry. To provide a little more breathing room through this very tight squeeze, the railroad built tunnels through two spurs of the Catoctin ridge following the Civil War. 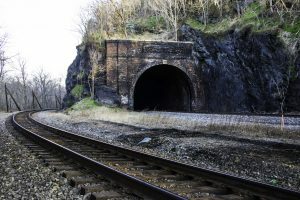 Once the Canal was out of business, the B&O ran tracks around the outside of the tunnels as well, and the Canal unfortunately became a dumping ground for the railroad.